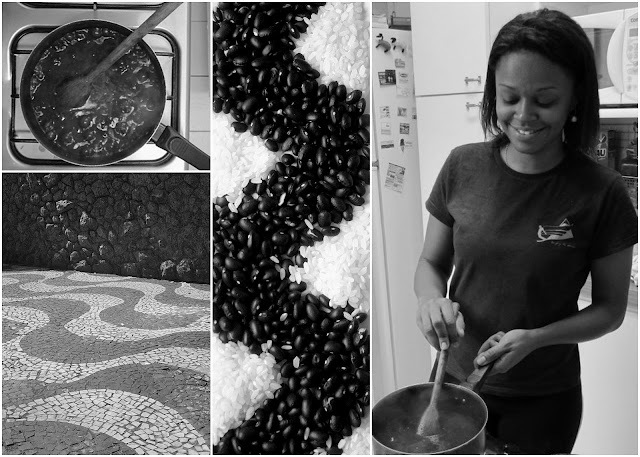 Long story cut short: I've been always obsessed about making this Brazilian treat, but called it quits when for a dozen of times it went wrong. And when something goes wrong with eggs, believe me it's such a difficult task to finish it. But finally, having 12 yolks left over from another treat, There I was, again trying to make it. Quindim, as it is called (probably derived from candy), is a popular dessert back home. I used to love when my mom made them. Through the years I tried to make it so many times with appalling results. But this time, I compiled many recipes I had to achieve this easy going one. The taste of eggs is not there, I promise. And the shiny surface will delight kids who love different textures in their mouth. My youngest kid couldn't have enough of them. And I am so happy that I broke of the last taboos standing on my kitchen! Yes, I can make quindins!!! Preheat oven to 350 F. You will need a deep baking mold, like a sheet cake mold that can be used as a water reservoir, so that a cupcake mold can go inside it, to make a double boiler. Coat a 12 cupcakes mold with butter and then sugar. After that you can start to work on the mix, whisking the egg yolks with the sugar. Then add the coconut slowly, with a wooden spoon. Fill 1/3 of each whole with the eggs mix, stirring again quickly before filling each cupcake hole. Let it rest foR about 15 minutes. Then fill the cake mold with warm water (not hot, please!). NOw carefully submerge the cupcake mold into the cake mold, avoiding any water to spill in the egg mix. Transfer to the oven and bake for about 45 minutes. Check after 30 minutes to see if the top is golden. If not let it bake for more time, checking every 5 minutes. When it is done, take it out from the water and let it cool on a wire rack. Transfer to the fridge, covered. Enjoy after a few hours! Happy Easter! We made these last year and we are planning on making them again, trying even more colors! It's part of my war against artificial colors in food. And yes, I know that (hopefully) nobody will eat the egg shells, but it's another opportunity to back to basis and find natural colors from vegetables. Because I plan on doing a big egg salad with those eggs I really chose my favorite brand, from Trader Joe's, eggs that are made by free-range chickens. Orange _ Boil paprika in 2 cups of water, when cold enough to the touch add 2 tablespoons white vinegar. To achieve a deep color you can soak the egg overnight. We found that 20 minutes is a good timing for a smooth orange. Blue _ Ours were not that deep blue. Cooked red cabbage for 40 minutes in two cups of water. It cooled down and I added 2 spoons of vinegar, which changed the color of water from blue to purple. Yet, the egg still came in a very soft shade of blue, soaked overnight, in the fridge. Pink _ Beetroot works on the egg faster than cabbage. It may take from 1 hour to overnight to achieve the desired shade. Beets were simmered for about 30 minutes. The same was followed: one tablespoon of vinegar for each cup of the colored water. Yellow - A very light shade of yellow can be achieved by dipping the egg in infused in 1 tablespoon dry sage. I didn't use the vinegar for this one and the color stayed. The other shade came from infused dill. I will test with saffron soon. Purple/Lilac - The egg was left in grape juice for 2 hours. I will test it again soon. One of the boys could not wait and immersed the egg on the paprika color. 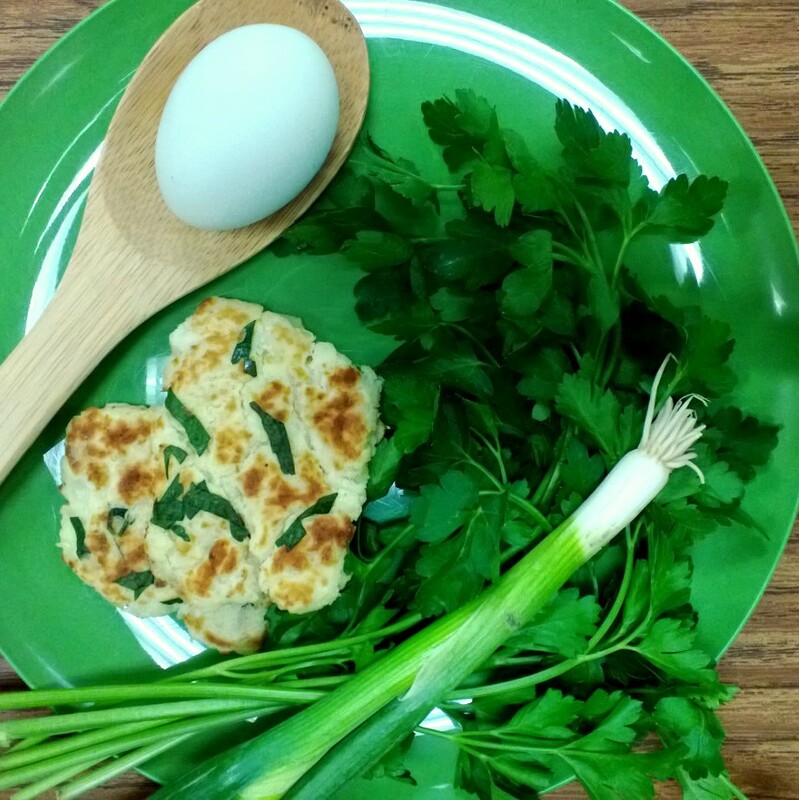 If parsley and spring onions could be picked out of the prattie's patties, we'd probably have just awesome reviews from the mini-chefs at the school's cooking club. But to our surprise most of the children ate the patties they prepared with enthusiasm, totally forgetting their dislike for green leaves. Maybe it was just the influence of a leprechaun... or the naturally green eggs brought by mom K, who cooks with me at school and has Easter Egger chickens that lay real green-shelled eggs. So if you'd like to celebrate St. Patrick's in easygoing style, here is the recipe. It is really easy, and with a little help using a skillet or griddle, kids may have lots of fun making them. At school they shredded parsley, used kid-safe scissors to cut the spring onion, little finger tips to peel the potatoes, forks to mash potatoes, and lots of energy to pat the potato dough and press it flat on the griddle. If you want to add some Irish mystique to the cooking, you can — as we did — read Jamie O'Rourke and The Big Potato, by Tomie de Paola. Irish or not, Happy St. Patrick's Day! Ask the little ones to carefully pat the potatoes after you put them on the griddle, which helps the patties stay firm and cook all the way through. This recipe makes about 8 potato patties. Preheat griddle to 350 F, or skillet to medium heat. Mash potatoes with the tip of a fork (or potato ricer) and transfer to a bowl. Beat egg lightly and add to the potatoes, integrating the egg to the mashed potatoes. Sprinkle salt and garlic into the mix. Add parsley and spring onions, and mash a bit more to make sure that the potato mix is even. Form little balls with a spoon, put on the griddle, and pat each one flat with the back of a wooden spoon. Grill for about three minutes on each side or until golden on both sides. Let's be honest: Store-bought frozen waffles pale in comparison to the real thing ... but they're still better than trying to make waffles from scratch on a busy weekday morning. Skip the sad, wimpy waffles in the freezer cases and make your own. Cook these up on the weekend, freeze them, and heat them in the toaster whenever you want satisfying waffles that are perfectly crispy and light. These are about as healthy as waffles can get. They're made with white whole wheat flour, which boasts all the benefits of classic whole wheat but with a milder taste and texture. I use just a bit of maple syrup for sweetener in vain hope that I can convince my boys they don't need syrup on the side. You can even leave the sweetener out completely — I have, and no one noticed. It's a very adaptable recipe. 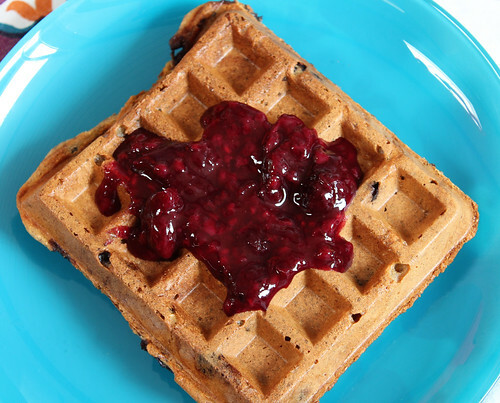 Use ground flaxseed and non-dairy milk for vegan waffles, or stir in orange zest or blueberries for different flavor. The one below has wild blueberries baked in and is topped with leftover berry compote from this week's fruit and yogurt cups. By all means, enjoy these freshly made! Make a double batch, eat some, and freeze the rest. Grab the waffles straight from the freezer and pop them in the toaster for quick everyday breakfasts. This makes six 4-inch square waffles. Combine dry ingredients in a large bowl. In a separate bowl, whisk together wet ingredients. Gently combine wet and dry ingredients, being careful not to overmix, and cook according to your waffle maker's directions. Let waffles cool slightly. Freeze in a single layer for 30 minutes, then package in a zip-top freezer bag. 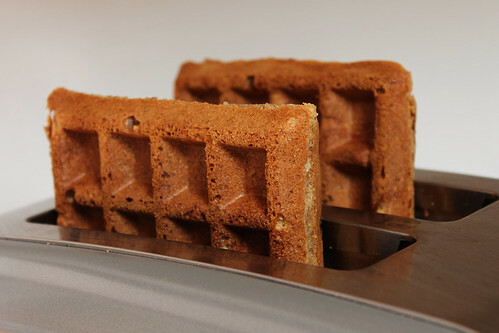 Take frozen waffles from bag and pop them in the toaster. Vegan: Use soy or almond milk and canola or coconut oil. Instead of egg, stir 1 tablespoons ground flaxseed into 3 tablespoons of water and let sit a few minutes until thickened. Extra crispy: Reduce flour by 1/4 cup and add 1/4 cup cornstarch. This is especially good if you’re enjoying some waffles right away and freezing leftovers. Orange: Reduce milk by 2 tablespoons and add 2 tablespoons orange juice. Add grated zest from one orange to batter. Blueberry: Add a half-cup of blueberries (tiny wild blueberries from the freezer section work nicely). 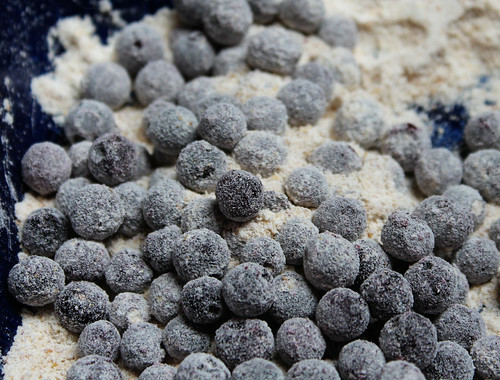 To keep frozen blueberries from turning your batter purple, roll them in a bit of flour before adding to the batter. Dr. Seuss — the creator of unforgettable characters such as the Cat in the Hat and the Lorax — would be 109 years old Saturday. Amongst all of his books my favorite is Green Eggs and Ham. I use it for cooking classes, and I read it again and again when my children start separating the greens off their plate, when they refuse to eat something they've never tasted before, and when I just want to have a big laugh. The idea of making eggs and ham green always amuses me — because, honestly, there's something about kids and green food aversion that I don't quite understand. Here's a collection of natural-colored green recipes and posts that celebrate Dr. Seuss' birthday, and the awesome writing that helps generations and generations of parents encourage their kids to try something new on their plate, or in their lives! Shakshuka - This Israeli staple for brunches is one of our favorite ways of making "green"eggs. Spring Pea Dip - Darienne's recipe is a great way to eat greens. As green as it gets, it is good-looking and useful for sandwiches. When I make it I add some garlic and for a vegan version substitute tofu for Parmesan. Green Crepes - This is a great way to make eggs green. They also can be filled with Pea Dip or even ham for added drama. Hass Avocado Muffins - I am still working on this recipe for a more tangy taste. It's a fun way to use California avocados and surprise people with something different! Popeye Sauce - Even if you think the sailor man is not a good role model, at least he ate his greens. This is a versatile sauce for pasta or vegetables.